What began in 1997 as an assistance program for seniors doling out vouchers to help them pay for their medications evolved into the statewide pharmacy for the uninsured in North Carolina in 2009. NC MedAssist in Charlotte has continued its growth, provided life-saving medications to over 15,000 North Carolinians in 2017. 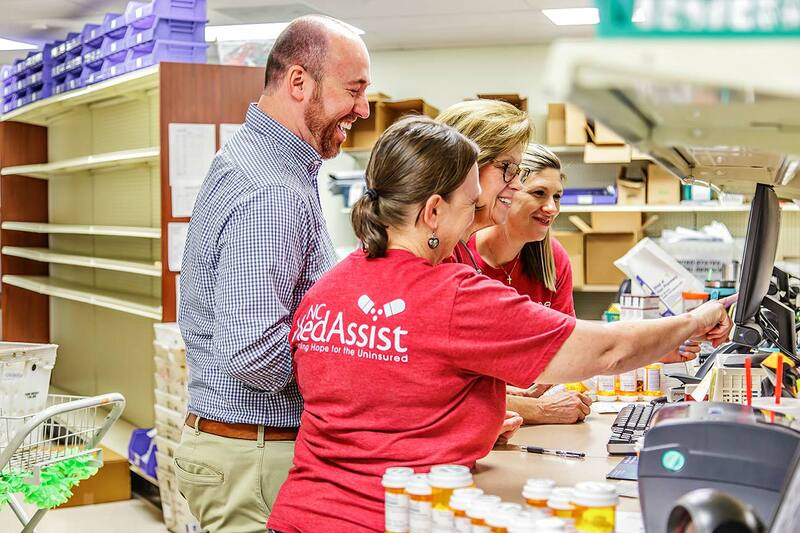 In addition to prescription medication assistance, NC MedAssist also runs an OTC program, giving away aspirin, children’s cough syrup, allergy medicine, and vitamins. A team of volunteers sort the medications and disperse them through The OTC Free Store or their Mobile Free Pharmacy events. With this program, they help another 20,000 families each year. Success with this kind of volume is made possible through a dedicated team, donations and volunteers, and a robot named Max. NC MedAssist works to ensure no North Carolina citizen has uncontrolled diabetes, asthma, or high cholesterol because of lack of access to medications. 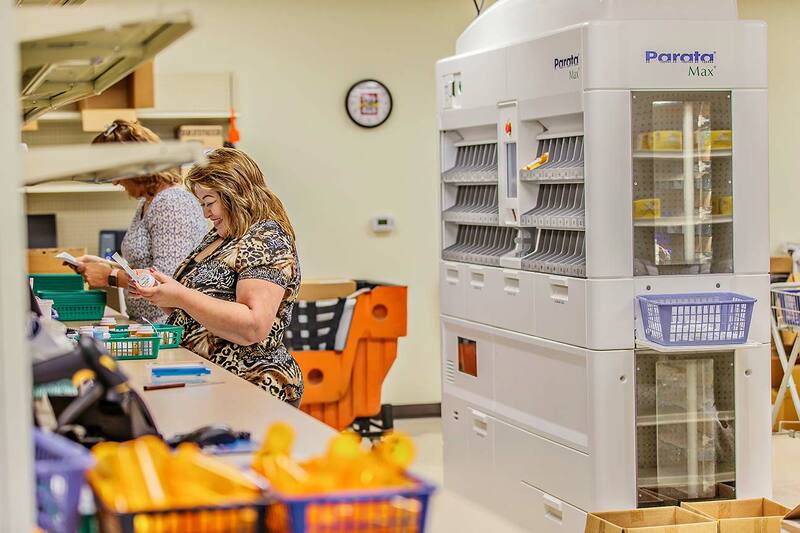 The 1500 square foot pharmacy in Charlotte dispenses and mails 900 prescriptions a day with a staff of 4 pharmacists and 4 technicians. Their mission energizes the team, and the results for patient health prove the model works. 77% of patients have reported better health over the previous year, and nearly half report they no longer need to choose between buying medications or groceries. What’s more, it’s estimated the program saved the state $55 million in one year in reduced emergency room visits and hospital stays. 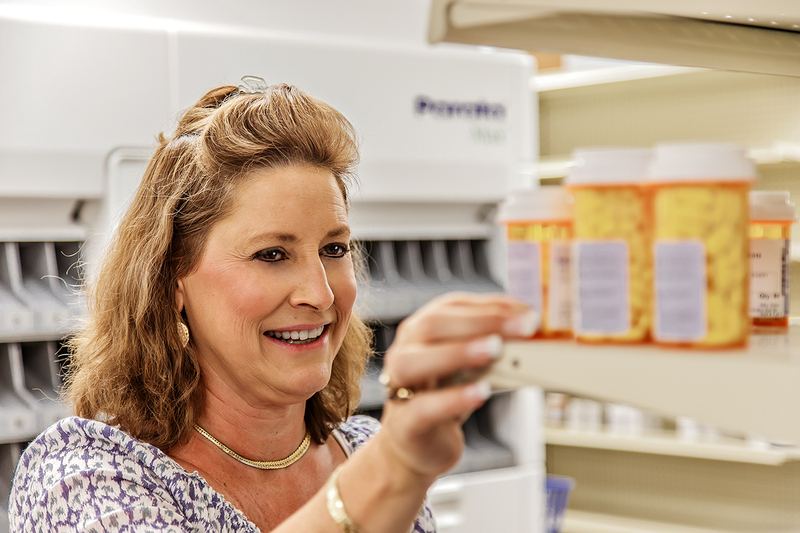 To do all this, the pharmacy — operating only 8 hours a day instead of keeping retail pharmacy hours —relies on an efficient workflow. 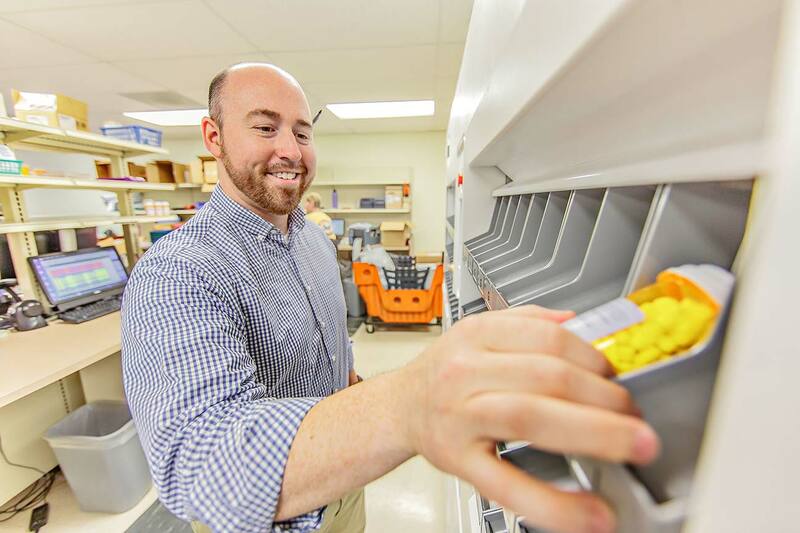 When pharmacist Dustin Allen noticed dispensing activities were creating a bottleneck as they approached 500 scripts a day, he knew the pharmacy wouldn’t be able to keep up without automation. Dustin had worked in pharmacies using robots before and knew what a difference they could make for pharmacy efficiency. As a non-profit, the organization was especially averse to making an investment in technology. But once Dustin broke down the costs — including the expense of pharmacists stepping in to fill prescriptions — the conversation became how they couldn’t afford to go without it. With Max chosen and the team confident it was the right decision, it was an exciting day at NC MedAssist when they got the OK to for it. While Max was chosen for its output, continuous operation, and ability to hold more scripts before needing attending, NC MedAssist also discovered there was much more to Max: the team behind it. From his sales director to the call center staff and field service engineer, Dustin says everyone has been terrific — professional, polite, and knowledgeable. To their delight, NC MedAssist also discovered Parata’s service takes it up a notch, remotely monitoring Max’s vitals. If there’s ever a need to make an adjustment to optimize the robot, Parata proactively responds. When Max first showed up, people were worried about being replaced by a robot. This is something we hear all the time. But the reality? 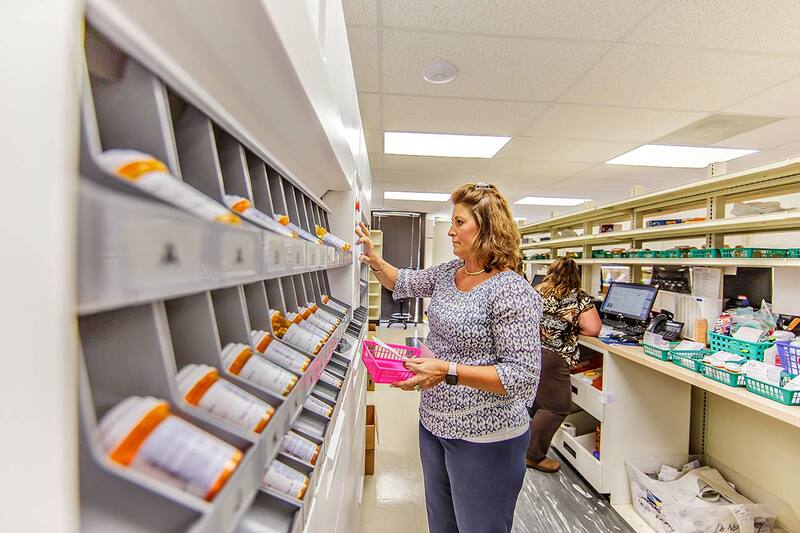 Once NC MedAssist determined the workflow and automated formulary that worked for them, they discovered their best workflow had one technician assigned to Max each day. That technician would replenish medications, caps, and vials and collect all the automated scripts for each patient. That patient’s scripts are then handed off to another technician for hand-filling. 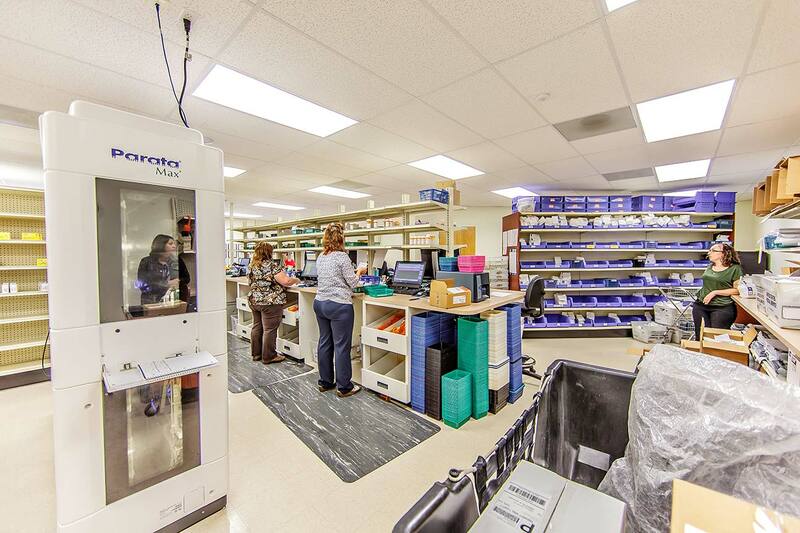 Because the average patient takes 4 medications — and some take 10 to 15 — this is a workflow that has removed the bottleneck while ensuring each technician is fully utilized. The NC MedAssist team jokes Max is in the running for employee of the year because the robot never takes a sick day. Their initial reluctance has been replaced with relief. Technicians don’t need to multi-task. When they talk to a patient on the phone, that patient gets the full attention and help they deserve. It’s the kind of care that wouldn’t be possible without automation keeping things moving in the background. Being able to provide better patient care, get all the prescriptions out in time in only 8 hours, and operating with a smooth workflow has reduced stress. Once worried about being replaced by a robot, the team now wouldn’t want to work there without it. Automation isn’t always an easy sell. It takes seeing the current barriers to the future you envision. When your prescription volume has met the peak of your workflow, it’s time to evaluate a solution that frees your team to provide care and reliably tackles your current and future prescription volume. 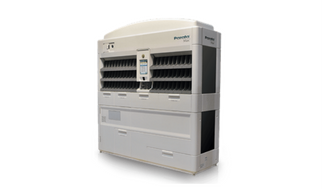 Keep your pharmacy moving with automation. Talk to Parata today. Get the World’s Best Pharmacy Robot on Your Team.